Faith guitars, founded in 2002, are designed by the legendary British luthier Patrick Eggle and feature elegant, contemporary designs with feather-light build and all-solid timbers. The entry level models feature a gloss finished Spruce top on satin finished Mahogany back and sides and have a sparkle and shimmer that belies their low price tag. The deluxe models indulge in an all gloss finish and substitute Rosewood for the back and sides giving a more strident, chiming tone. Body styles include the Mercury (L-00 sized parlour), Venus (000 style), Saturn (dreadnaught) and Jupiter (super jumbo). All models are available as electros. 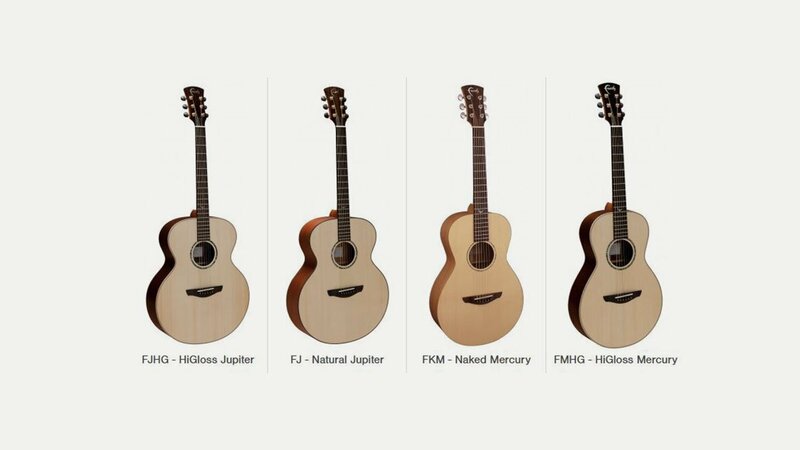 Their latest Series – the PJE Legacy – are high quality and based on Patrick James Eggle’s historic acoustic body shapes. Patrick’s involvement is not limited to the drawing board; each Faith instrument is checked for quality in Patrick’s workshop on arrival in the UK.